Sugar maple trees need snow to keep their roots warm. This allows them to grow fast enough to help maintain people's livelihoods while also absorbing carbon dioxide emissions. It may seem paradoxical, but sugar maple trees need snow to stay warm and grow. Each winter, a deep blanket of snow — 8 inches deep or more — covers about 65 percent of northeastern sugar maples. Without this insulating snow, the soil freezes deeper and longer, damaging the trees' shallow roots. A study published last week in Global Change Biology warns that without the snowpack, maple trees are projected to grow about 40 percent slower. As climate change reduces the amount of deep snow in New England, the study says this spells trouble for the trees — and for humans — as the trees not only give us syrup, but eat up a chunk of carbon pollution. "If temperatures keep increasing and the snowpack keeps shrinking, it suggests that our maple forests are going to not grow as much, and therefore not sequester as much carbon," says Pamela Templer, a biology professor at Boston University and senior author for the study. Templer says as forests in the U.S. pull carbon dioxide out of the air and store it in trees, plants and soil, they can offset somewhere between 5 to 30 percent of America's carbon dioxide emissions. Damage to maple tree growth, she says, also has more immediate economic consequences. "Many people in the northeastern United States rely on sugar maples for a living," Templer says. "And if these forests aren't growing as much, it's going to likely affect the livelihoods of the people who rely on this tree species." "This paper is a big deal," says Peter Groffman, a biogeochemist at the Cary Institute of Ecosystem Studies in New York, who has collaborated with Templer in the past but was not involved with the current study. "When you talk to people about forests in New England, the No. 1 question that people ask is, 'What's going to happen to the sugar maples?' This is very relevant to that question." While scientists have known for years that deeply frozen soil damages the roots of sugar maples, Groffman says, it was unclear whether this damage affected tree growth. "That's what's so exciting about this study," Groffman says. "It shows — using very meticulous and very careful methods — that, indeed, manipulating the snow to induce soil freezing does reduce the growth of the tree over the long term." The researchers also found that the amount of northeastern forest with snowpack could shrink by 95 percent by the end of the century — from 33,000 square miles to just 2,000, under the worst-case emissions scenario. That's dwindling from an area bigger than Maine to one that's half the size of Connecticut. Even under a lower emissions scenario, the snowpack-covered area could still decline by 49 percent, to 16,500 square miles, says lead study author Andrew Reinmann, a forest ecologist at the City University of New York. "So if you like skiing, go now," he says. The research leading to the maple tree study began a decade ago. For five winters, from 2008 to 2012, Templer and her team shoveled away the first four weeks of winter snow from patches of forest in New Hampshire's 8,000-acre Hubbard Brook Experimental Forest. This approximated the diminished New England snowfall expected by the end of the century. (They left the first few inches of snow in place, so they wouldn't accidentally shovel dirt later.) After four weeks of clearing, they allowed snow to accumulate naturally for the rest of the winter. After five winters of shoveling, and then a year off to see if the trees would bounce back, the researchers took core samples of the sugar maples and examined their growth rings. The sugar maples' growth slowed by about 40 percent after the first two years of the experiment. They did not recover in the year off. Reinmann says it's unclear if the trees will return to their normal growth pattern after a few more years with normal snow, or if the damage is permanent. "Whether or not this means that sugar maples will die or just lose a competitive edge is not quite clear," he says. The researchers note that warmer winters may have some benefits, like lower heating bills and longer growing seasons. And, adds Templer, maple sugar production has been able to keep up with climate change so far. "They can still extract sap and make delicious maple syrup," Templer says. 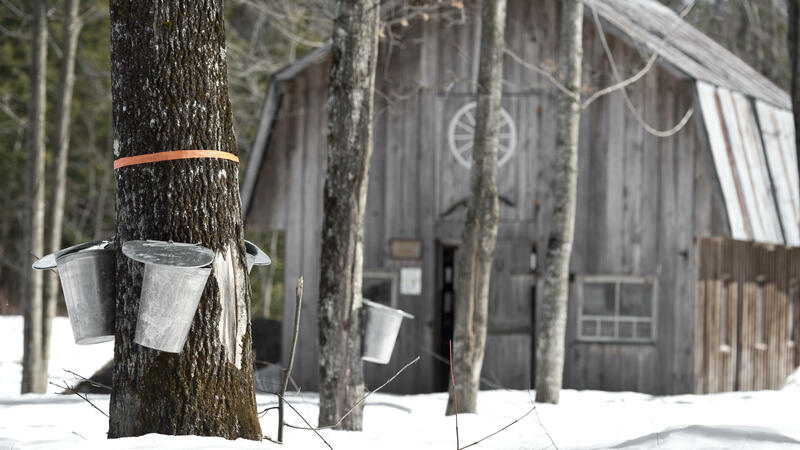 "The concern is that over the long term, we might not have maple syrup simply because the conditions that are required for making [it] might disappear." This story comes to us from member station WBUR in Boston.